Combine robots, 3D graphics, and actors and what do you get? Box, an amazing performance by San Francisco-based engineering firm Bot & Dolly. It’s a short film that explores how the digital world interacts with the real world. It is the culmination of multiple technologies, including large scale robotics, projection mapping, and software engineering. We believe this methodology has tremendous potential to radically transform theatrical presentations, and define new genres of expression. Our favorite sci-fi billionaire is at it again. This time it’s a holographic gesture system. 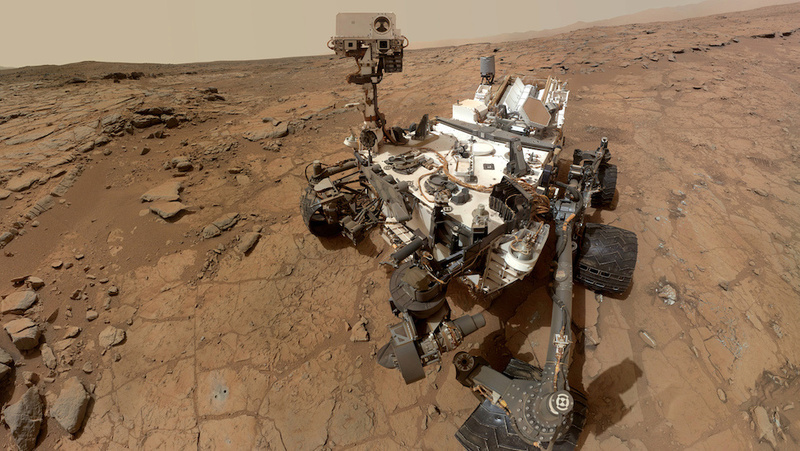 Y’know…a year after implementation, nerds around the world will have the upper body strength of Mr. Universe! I could see this working well for specific applications (design, CAD, art, medicine, etc. ), but games? Hmmm. The Iron Man movies have become synonymous with next generation technology. Many innovators are trying to recreate the magical interfaces that we are now used to seeing on the silver screen. One of those people is billionaire and space age fanatic Elon Musk, who’s been known to take ideas and realize them with the help of his earned fortune. Tony Stark’s Jarvis holographic interface is just one of the technologies that Elon Musk has been trying to recreate. A couple weeks ago, Elon Musk tweeted that he and his SpaceX team had just built and 3d printed parts for a rocket using a hand gesture system which he was eager to showcase. The video was uploaded recently, and since then, Mr. Musk has made several intriguing updates about what goes on over at his innovative company. Even though the expectations were almost too high, people were still impressed by the innovative way this system utilizes hand gestures to interact with the objects on the screen. The ability to model and alter objects by just using hand gestures is a a huge optimization. If the team manages to incorporate a holographic interface using Displair, or something similar, this technology could rapidly become something that is really close to what we are used to seeing in the Iron Man movies. In this video, we are taken through the process of building the virtual reality holographic interface system Elon Musk and his team have been working on. Even though it’s not a legit holographic interface, it still is in a way. By using virtual reality glasses, the system allows the user to seamlessly operate in unlimited space. The question is whether or not virtual reality can be called a holographic interface, or if it is still just a virtual reality system. Either way, with people like Elon Musk working on holographic interface systems and spending millions on developing software and hardware to bring them to reality, I am quite sure that we’ll be seeing some pretty cool stuff very soon. This looks like something out of “V” or most any alien invasion movie, but stunning is a great word for the competition winning design. 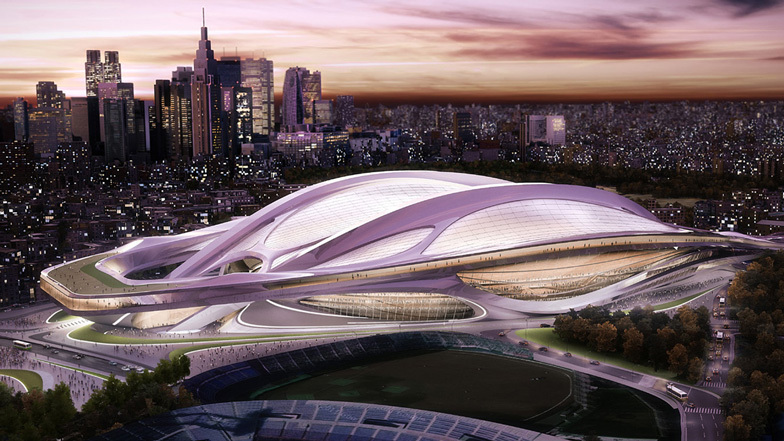 News: the forthcoming National Stadium of Japan by Zaha Hadid Architects is now set to become the main sporting venue for the 2020 Olympic and Paralympic games, following the news that Tokyo will be the host city. The new 80,000-seat stadium will host the opening and closing ceremonies for the 2020 games, as well as athletics, football and rugby events. 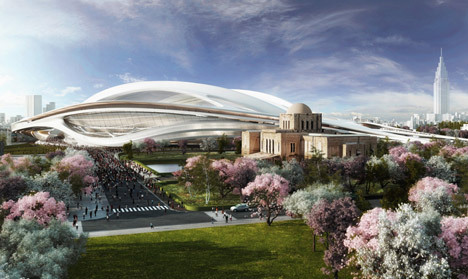 “The stadium will become an integral part of Tokyo’s urban fabric, directly engaging with the surrounding cityscape to connect and carve the elegant forms of the design,” said Zaha Hadid, after winning a competition to design the stadium in November. “Our three decades of research into Japanese architecture and urbanism is evident in our winning design and we greatly look forward to building the new National Stadium,” she added. 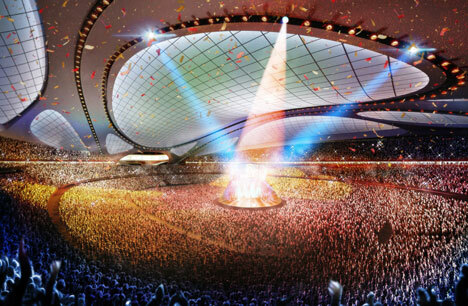 Set to replace the existing Kasumigaoka National Stadium, the new building will join Kenzo Tange’s iconic 1964 Olympic stadium in Yoyogi Park, which will function as a handball arena this time around. Zaha Hadid Architects will also work on this building, renovating the structure and adding a retractable roof. Two other venues from the 1964 games – the Nippon Budokan and the Tokyo Metropolitan Gymnasium – will also be reused, offering venues for judo and table tennis. Additional arenas will be constructed in downtown Tokyo in an effort to save energy and reduce the need for transport investment, while the Olympic village is proposed on Tokyo’s harbour and will be converted into housing after the games are over. So, I had my doubts. Would I really use a clicky in my 3.5mm port? Watch the video at the end. I bet you’ll pitch in $5 toward the Kickstarter, too! If Kickstarter had a 24-hour funders club, Pebble and the Bolex Camera would be welcoming Pressy today. In under a day, the multifunction Android controller has more than doubled its $40,000 goal (raising $108,435 from 4,889 backers as of this writing) and with 45 days left to go, the numbers keep climbing. Perhaps its simplicity is what’s making it such a hit. 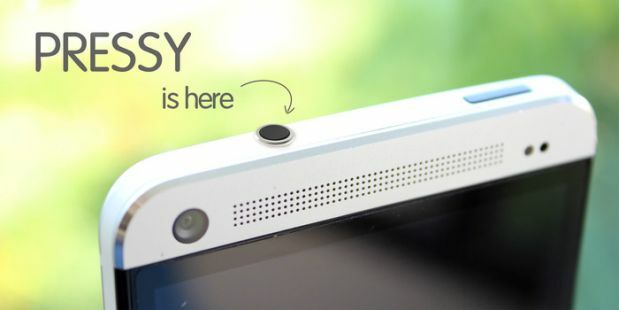 Pressy plugs into any Android device’s headphone port (Gingerbread and above), and clicking its unobtrusive 0.7mm-tall button controls and automates any manner of your gizmo’s functions. Through its app you can assign a given task to a sequence of clicks; it’s up to you if it takes two short clicks to speed-dial your mom or one long press to snap an unobtrusive picture, for example. You can still use it if you have a pair of headphones in too, with the cans’ play button subbing in for control. Clever. Unlike other Kickstarters, this isn’t some far-off prospect: Developer Nimrod Back has promised Pressy will be available within four months. A basic Pressy will set you back $17, for a choice of colors with a keychain storage sheath you’ll have to pony up $25. Oh, and if you fancy yourself a programmer and want the device’s API, then drop $1,000 and make that tier’s one other pledge less lonely. London-headquartered VC firm Balderton Capital is betting on popular demand for 3D printing with a seed-stage investment in 3D printing network 3D Hubs. The rate of growth for 3D printing is tremendous. About 23,000 printers were sold in 2011, according to a recent McKinsey report, which is up 300% in average annual growth since 2007. The industry as a whole could have an economic impact of $230-$550 billion per year by 2025. 3D Hubs, a six-person team based in Amsterdam, is building a global network that connects people who want to print with 3D printer owners. Here’s how it works: 3D printer owners sign up to be listed on their local “Hub”, which sets its own price per print plus material used. 3D Hubs performs a quality check for each uploaded digital model, delivers the order and processes the payment. It adds a 15% charge on top of the quoted price for each print. The community aspect is a big part of 3D Hubs’ offer — unlike centralized services, customers know they’re supporting local makers and can pick up prints rather than wait for them to be shipped. Expansion follows supply and demand, with cities “unlocked” once a certain number of printers become available. The network currently spans over 500 printer locations in cities including London, Amsterdam, Berlin, Antwerp and Copenhagen. Other options for those without a 3D printer to call their own include Shapeways, an online marketplace for making, buying and selling 3D printed products that ships anywhere in the world. Staples in the Netherlands and UPS in the US, also plan to offer on-demand 3D printing services.